If you repeatedly order print items such as stationery, business cards, postcards or brochures, an online print ordering site can help you control corporate style and content, as well as keep records of your orders. A Castle Press Company Store platform is custom designed to meet your specific needs. And your online Company Store order platform is developed and maintained inside the Castle Press, where we can access and update as needed to ensure the system meets your needs. Your Company Store can be set up using a business-to-business model or a retail model. Users may self-register. Registration can be restricted if desired using special registration passwords, or other information. Inventory items, such as marketing or promotional items, can be ordered and then shipped to various locations. Benefits are lower costs due to reduction of inventory caused by the “hoarding mentality” in outlying branches. Additionally, you have a better control over obsolescence and reorder points. Custom items, such as business cards, letterheads, or envelopes, are created online by the end user right from their desktop. 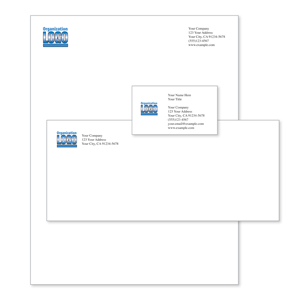 Direct mail campaigns using postcards, invitations, or brochures, can be initiated by the salesperson in the field using approved templates and protocols. Once the campaign order is placed Castle Press takes care of printing, addressing and mailing. Templates can be created with multiple variations in the layout to accommodate situations such as extremely long individual names or titles. Data can also be prefilled according to user-selectable drop down menus for address or text selections. The template system allows for full control of the design according to your corporate design rules. After data is entered a proof is created for online review and proofreading. If an error is discovered, it is very easy to go back one step to make the correction and create a new proof for review. As part of setting up your company store, production schedules and delivery dates are established. Your team members will know in advance when their order is going to be delivered. We have a variety of billing options to suit your needs. You may choose to show the users pricing online or prices can be hidden. Purchase orders can be required. Purchase order format can be enforced. Invoices can be sent to corporate accounting; or the end user may purchase securely online with a credit card. We have an optional supervisor approval system where all orders must be approved by a pre-determined person or persons. Approval supervisors can change variable content and recreate PDFs if necessary. The catalog can also be set so only orders over a predetermined amount require approval. Email notification is sent to the user at time of order. If approval is required, another email is sent when the order is approved or denied. Another email is sent when the order ships. Approval supervisor(s) receive similar notifications. The email requesting approval includes links to approve the order. Email notification of all orders can be sent to designated people within your organization. Let’s get together to discuss your specific needs and see how online print ordering can benefit your company.